Photo courtesy of Andrew Hubbard. Subtitle from Miyazaki’s “The Borrowers”. In anime, beans made beans! Oops … I did it again! Soylent Beans are made out of humans! … And they give you worst gas that you can ever believe. Cyborg beans didn’t make it. Their batteries ran out. Just for the record, in case you haven’t seen the film, this is intentional and consistent throughout the script. Borrowers always mispronounce the Japanese for “human”. As Ben said, this is no mistake; it is a constant of borrower speech adapted directly from Mary Norton’s original English language novels. It’s consistent with the original books, which were written in English by an English bean. – Mommy, these human beans tried to eat me! – That’s because we’re vegetable beans, sweetie. The guy does kind of have a “hey, what smells?” expression on his face. Ach Ya. Ist der dead of night. I do enjoy eating female beans. I’m glad that Beans is safe. I didn’t think he’d make it. @ Marum And male beans are eaten with their weenies. In the beginning, God created Adam and beans. 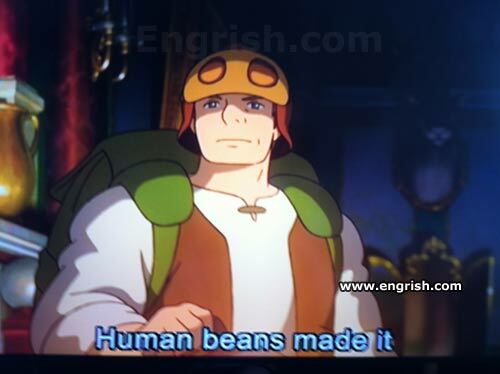 Human beans are their descendants. You can be a cannibal and get your daily fiber as well. Don’t touch them, you don’t know where they’ve bean. The human beans made it. It was a long journey and now they need to pea. These human beans have lots of moral fibre. They made a Vine video, of course. In the book, this is the spelling that is used. It’s not Engrish, just them taking into account a peculiarity of the book. Beef, beer, and beans made America. Further proof that a certain Mr. Bean is an alien. And he who denied it, supplied it !! I saw this same mistake on a sign held by an illegal immigrant activist. This is actually intentional, if you’ve ever seen the anime. It’s not Engrish. This is not actually a mistake. It was intentionally put there because “The Secret World of Arietty’ is based on a book series. in the series, the borrowers (little people) don’t know much about humans, so they mispronounce human being as human bean. Check wikipedia for more info. The pintos and the limas don’t get along. The band most famous for “Nobody But Me” song featured on oldies stations.